DIY orthodontic treatment has been expanding quickly with new companies entering the market all the time. While it may seem like it is harmless to straighten your teeth on your own, the truth is that unsupervised health care treatment can have negative effects. As an orthodontic specialist and an expert in the art and science of moving teeth to create amazing smiles and healthy bites, I am obviously biased. Nevertheless, I believe as a professional, it is my duty to my community to shed light on some of the things the DIY companies fail to talk about. Let's break down the three most common reasons people participate with DIY orthodontics from both sides! 1) Cost - all of these companies market against one another for the cheapest solution and thus use the cheapest means to deliver the treatment. However, they don't have many of the costs an orthodontic office has with team members, an office space, and the latest in-office dental technology. This makes for a cheaper alternative to seeing a professional. 2) No appointments - no visits to the doctor's office means that you get to do all the treatment from your home and can progress the treatment as it fits your own schedule. 3) Convenience - for the first molding of your teeth, they will send you materials to your house so you can do the molding yourself. Then, the aligners are delivered directly to you. 2) When your care is not supervised by an orthodontist, you are responsible for monitoring your own outcome and the side effects of treatment. If you aren't aware of what to look for, you may end up in a worse spot than where you started. For example, you may have closed the gap in your teeth, but now your bite does not fit together. Or you may have corrected that crooked tooth, but now there is excessive gum loss. Orthodontic appointments in our office are typically pretty short and painless - they are worth it to ensure the best result. 3) While it may be convenient to do all of this in your pajamas at home, you should really have a professional exam and x-rays prior to starting. There is a lot of nuance to orthodontic treatment. Even if a company claims you will have a "doctor assigned to you," if you don't know whom he/she is, how can you be sure they really care about your outcome? It is all up to you! 1) In our office, we use Invisalign which incorporates a series of attachments on the teeth along with other appliances to ensure a smooth experience and a great result. Attachments are bonded to your teeth to help them move. DIY orthodontics may work for some very limited and minor movements, but chances are if you want a more dramatic change, you will need something more robust to complete the complex tooth movements. 2) Orthodontic treatment can be a significant expense and we acknowledge that. However, we offer very flexible payment plans and we will work with insurance to keep the cost very reasonable. When you break it down, it might not cost that much more to see an orthodontist and in fact, with insurance, it may not be much different than a DIY company's cost. While DIY orthodontic treatment may be tempting for a few reasons, I encourage you to seek an orthodontic consultation if you are curious about straightening your teeth. We don't charge anything for a consultation, so it is very low risk! We can guide you and educate you on the best way to achieve your goals, and we can save you time and money in the long run. I have some patients that attempted the DIY route prior to coming to our Downers Grove office, and every single one of them wished they didn't waste the time or money trying to go it alone. The advertising makes it sound so simple and easy. But, how often do you cut your own hair? There are so many things that we could do ourselves, but we know if we trust someone with experience, the result will be so much better! When you hear the words sleep apnea, you probably don’t think much about kids. 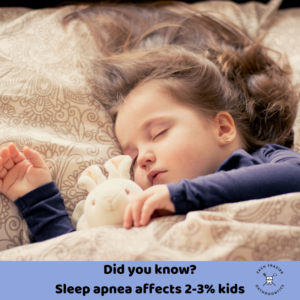 However, sleep apnea affects 2-3% of kids, and the symptoms are subtler than they are in adults. Children with sleep apnea may appear totally normal at a physical exam, but there are some signs to watch out for. This list is not all-inclusive, nor does it mean that any one of these indicates a problem. However, if some of these describe your child, it may be a good idea to consult with your family doctor about the possibility that sleep may a problem. Snoring – No child should snore – period. An occasional load breath may be heard, but your child should not be snoring or breathing loudly at night on a regular basis. Snoring in children goes hand-in-hand with sleep apnea, and this should definitely be brought the attention of your family doctor. Teeth grinding – Grinding teeth at night may be a defense mechanism for the body. If your child is struggling with proper airflow at nighttime (due to a collapsed airway, tonsils, adenoids, allergies, etc. ), pushing the lower jaw forward often helps open the airway to allow a better passage of air down the throat. This protective measure for the body is helpful for breathing, but can really cause long lasting harmful effects on the teeth. Bedwetting – Typically, by around the age of 5, most kids will be able to sleep without wetting the bed. An accident here or there is much different than an older child who is wetting the bed frequently. Although this can be due to other medical conditions, bedwetting can be linked to sleep disorders as the body fails to awaken when the bladder is full. Mouth breathing – While humans are able to breathe through both the nose and the mouth, we are technically “obligate nasal breathers” as a species, meaning we are supposed to breathe through our nose. Deviated septum, allergies, and other nasal airway obstructions can make it difficult to breathe through the nose. Mouth breathing can affect the development of the face, jaws, and teeth position, often times leading to orthodontic treatment to normalize the effects of letting the mouth hang open all the time. ADHD – Sleep issues may contribute to problems relating to attention span. When some kids don’t get enough sleep, they actually act opposite of what we would expect – they actually become hyperactive rather than tired. Additionally, they may be irritable, unfocused, and easily distracted, and these consequences can have a very negative effect on school performance. Studies have shown that 1/3 kids with ADHD also snore while sleeping. Morning headaches – If your child’s airway is partially blocked while sleeping, the amount of oxygen in the blood will be reduced. This reduction in oxygen level may lead to headaches, specifically in the morning after waking from a poor night’s sleep. Sleepwalking and sleep talking – Typically if these are observed, they are usually shortly after going to bed and associated with “confused arousal.” This means that something startles the child awake, but they are still subconscious and may not be fully awake. This arousal may be from other medical conditions, but it may also be from airway obstruction that causes sleepwalking and/or sleep talking. Downers Grove has always been a special place for me. I grew up here, went to the local schools, and even went to Downers Grove North right down the street from my office. One thing that strikes me is how many people share my story: they grew up here and now they have come back to raise their families in DG as well. It truly speaks volumes about our community. I'm proud to be your hometown orthodontist! Keep Your Kids and Their Teeth Safe! In the past couple weeks, we have seen multiple children with injuries from one thing - trampolines! I know - the kids love them and they seem fun, but an article by the American Academy of Pediatrics estimates that there are about 100,000 emergency room visits per year due to trampoline injuries. That is a lot! The injuries can range in severity, from bone fractures to sprains to spinal cord injuries. With trampoline parks becoming more and more popular for birthday parties and events, we have to make sure we are considering the safety of our children. So why is the orthodontist talking about this? Teeth can get pretty banged up by trampoline injuries as well. The teeth can be displaced or pushed back into the bone due to heavy impact, and this can compromise the tooth forever by damaging the nerve and blood supply. If the nerve and blood supply are damaged, root canals and crowns may be necessary on the front teeth which will lead to tens of thousands of dollars in lifetime maintenance of these critical front teeth. 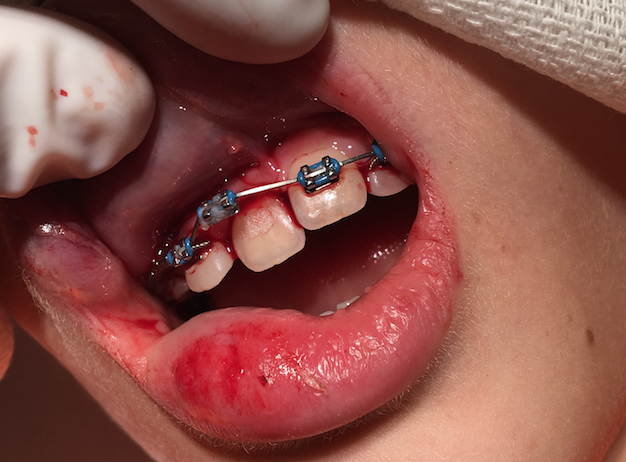 Even worse, front teeth may be completely knocked out and lost from trampoline injuries. The front teeth are a critical component of our smile, and although the injury can be expensive, the effect it will have on a smile is even more devastating. A lifetime of fake or missing teeth in the front is not worth the risk. We cannot protect our kids from every injury in the world, but in my opinion, I recommend that your kids skip the trampoline park!